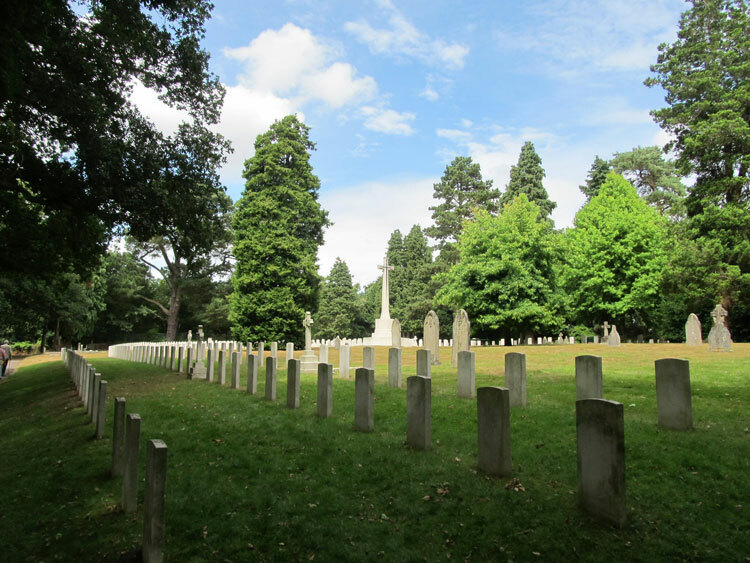 Close by what was once Netley Hospital, and now in the grounds of the Royal Victoria Country Park, is the Netley Military Cemetery. 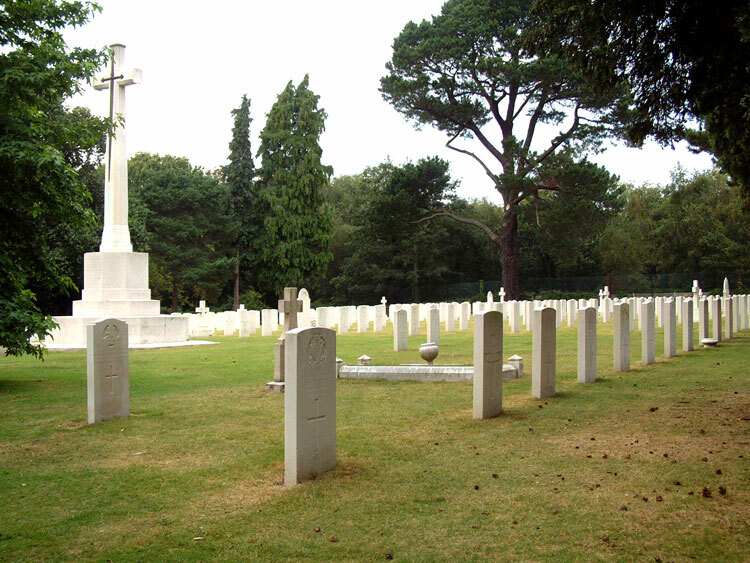 Soldiers who were treated in Netley Hospital from the time it first opened in 1865 are buried here, and the cemetery is now maintained by the Commonwealth War Graves Commission. 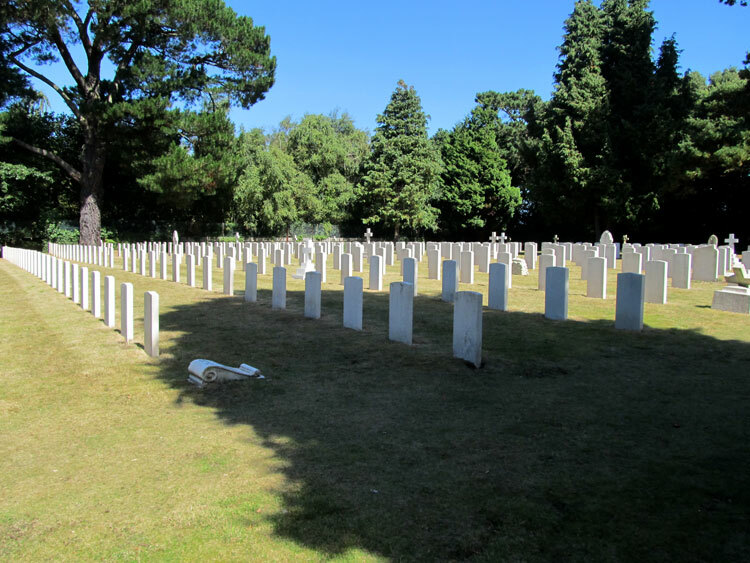 As well as the soldiers buried in the cemetery, family members of those who looked after them are also interred here. For the earlier 19th century graves, there are only headstones for the officers' or family member graves. Four members of the Yorkshire Regiment are buried in this cemetery, - Lance Corporal Jonathan Carpenter, Serjeant Robert Gallon, Private John Palmer and Lance Corporal J H Snow. 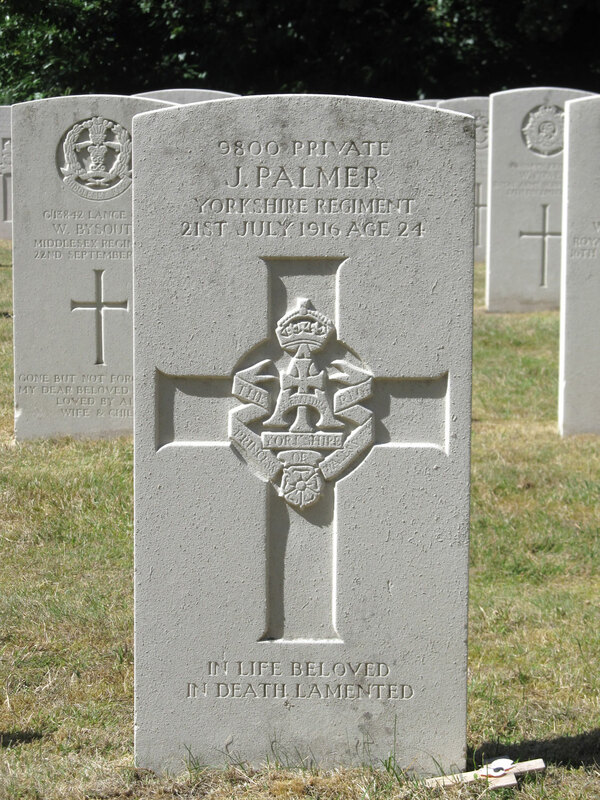 Derek Walker has supplied photos of the headstones for Private Palmer and Lance Corporal Snow, as well as some additional photos of the cemetery. We are very grateful to him for use of these photos. 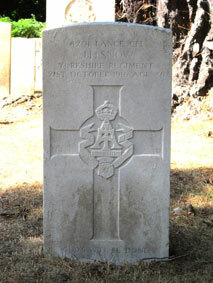 For photos of the headstones, select the thumbnail image for a larger sized image which opens in a new window. 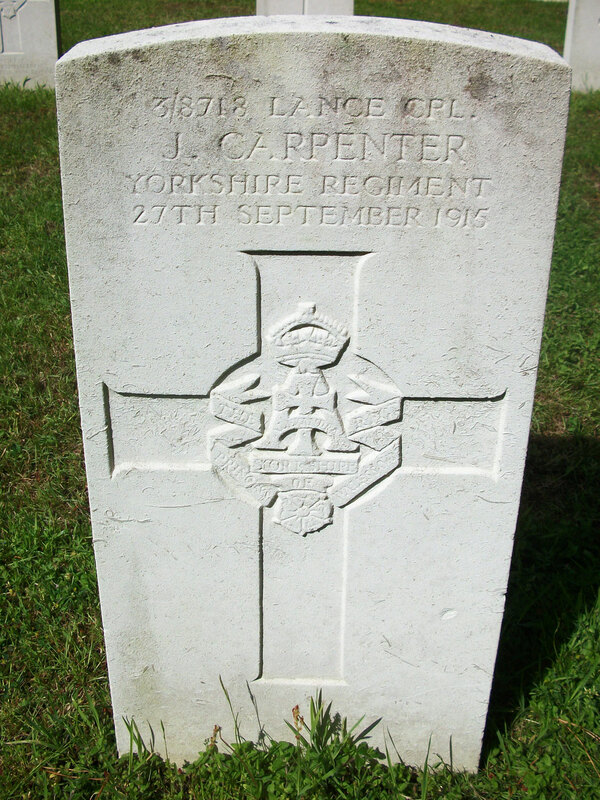 Lance Corporal Jonathan Carpenter, 3/8718. 6th Battalion Yorkshire Regiment. Died at home 27 September 1915. Born Stockton-on-Tees, Enlisted West Hartlepool. Photo by Charlie of the Find a Grave website. 6th Battalion Yorkshire Regiment. 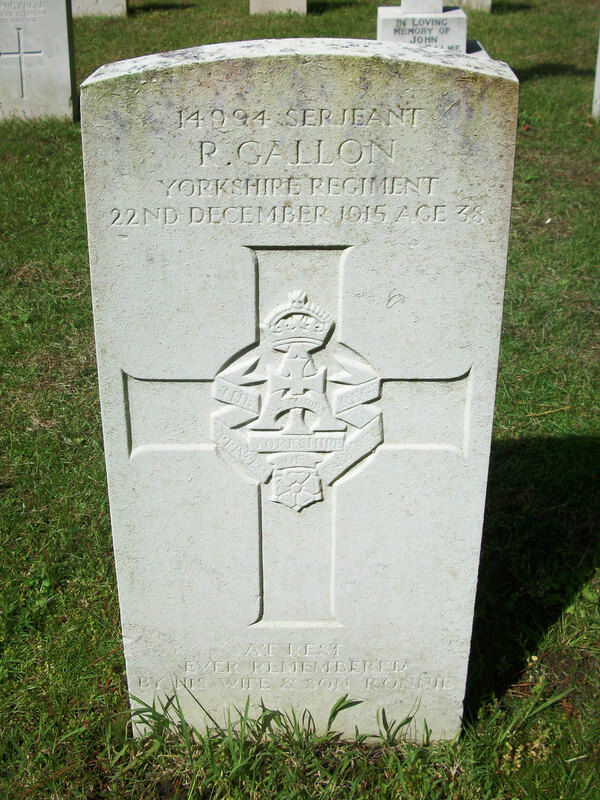 Son of Mrs Annie Gallon, Husband of Louisa Gallon, of 18 Union Street, Seaham Harbour, County Durham. Died at home 22 December 1915. Aged 38. Born North Shields, Enlisted Sunderland. BY HIS WIFE AND SON RONNIE"
2nd Battalion Yorkshire Regiment. 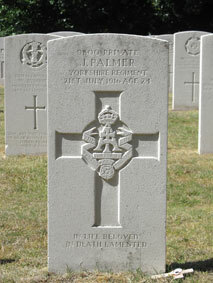 Son of William Palmer; husband of Violet May Palmer, of Maison du Qaui, 41, High St., St. Peter Port, Guernsey. Born in Wales. Died at home 21 July 1916. Aged 24. Born Abergwynfi (Maesteg - Glam), Enlisted Pontypridd, Resided Guernsey. Lance Corporal John Henry Snow, 4201. 4th Battalion Yorkshire Regiment. 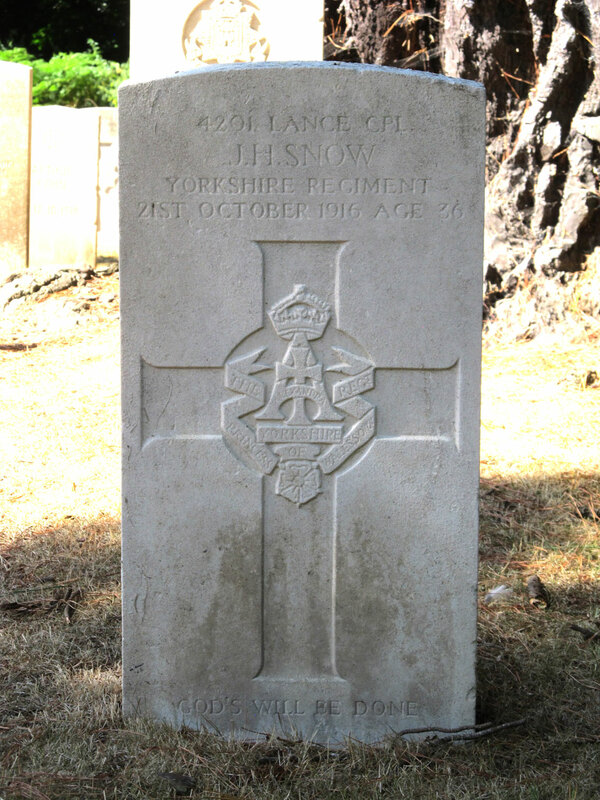 Son of John and Mary Ann Snow, of 177, High St., Old Fletton, Peterborough. Died at home 21 October 1916. Aged 36.